LeBron James is still one of the most dominant players in the NBA. Based on his Hall of Fame play, multiple titles and many individual accolades, LeBron James rookie cards continue to be in-demand and prices keep trending up. His exact place in history will likely always be debated, but he is largely unmatched in the modern hobby. Understandably, Michael Jordan will remain the most revered basketball player among collectors, but James is closing the gap. After establishing his winning ways in Miami, he made his way home to Cleveland, finally bringing hardware to the championship-starved city. Now, he has taken his talents to the Los Angeles Lakers, looking to improve their title aspirations. Shop for LeBron James rookie cards on eBay. As with most top players, LeBron James rookie cards have long been collector favorites. These first-year cards are found in 2003-04 NBA products. Combined with several other strong rookie players from the 2003 NBA Draft, including Carmelo Anthony and previous teammates Chris Bosh and Dwyane Wade, James helped drive basketball cards back into relevance. The following list contains some of the best options for collectors interested in LeBron James rookie cards. While there is no specific element present in all 10 cards, they would each be a terrific addition to any collection. 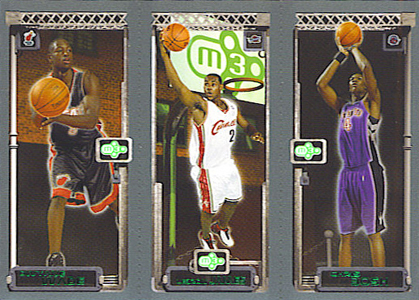 The LeBron James rookie cards below are ranked according to the main base version of each card. While value is important, it is not the only criteria taken into account as the design and aesthetic appeal were also considered. Popular parallels are noted, but are not included in the ranking process. Of course, there are plenty of other LBJ rookies to chase. Check out some of the additional options for King James in our Guide to Overlooked LeBron James Rookie Cards. You can also get a good look at his most popular cards on eBay with our real-time LeBron James hot list. This is a classic example of keeping the hobby status quo. I have no idea why companies continue to put out the three-players-on-one-card format, especially a rookie card. 1980-81 Topps Basketball is the exception. 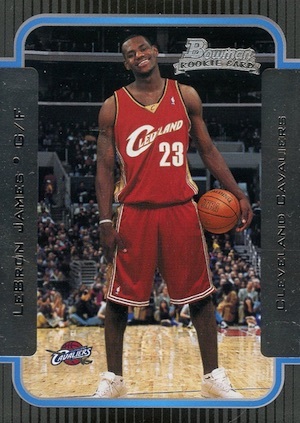 However, this card deserves a place among LeBron James' top rookie cards in spite of that. LeBron James shares card space with two fellow rookies in Wade and Bosh. These three rookies would eventually form the "Big Three" in Miami and help James achieve his first NBA championship. This card was certainly more of a draw when James still played with the Heat, but it provides a nice reminder of their success and a snapshot of the quality found in the 2003 NBA Draft. With a print run of only 99, the 2003-04 SkyBox LE is the only card to match James' 2003-04 Exquisite rookie card in rarity. The classic design and die-cut top portion give the simple card an elegant look. More plentiful parallels help drive interest with Gold Proofs (#/150), Artist Proofs (#/50), Photographer Proofs (#/25) and Executive Proofs (#/1). The Gold Proof parallel tends to pop up more often than the base version due to its higher print run. Collectors should be aware that there is also a retail version that is not numbered or die-cut. Once a basketball hobby staple, Finest has gone the way of many other basketball brands with Panini currently holding the sole NBA license. Regardless, this loud 2003-04 Finest design features a comic-book look, but manages to pull it off. Although the numbering is on the higher side, it still enhances the value of the card. Popular parallels include Refractors (#/250), Gold Refractors (#/25) and X-Fractor (1/1). 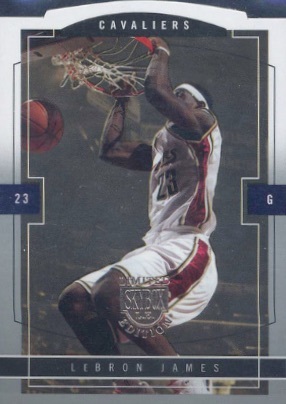 2003-04 Bowman Chrome is another lower-tier option among the top LeBron James rookie cards. Using a casual layout and photo, the card evokes a playful feel that matches the youthful image of James. While not autographed like the Dwyane Wade and Chris Bosh cards in the set, James' Bowman Chrome rookie still commands a decent amount despite being a standard base card. Again, like Topps Chrome, Refractor parallels are the main draw. The parallels options here include base Refractors (#/300), X-Fractors (#/150) and Gold Refractors (#/50). 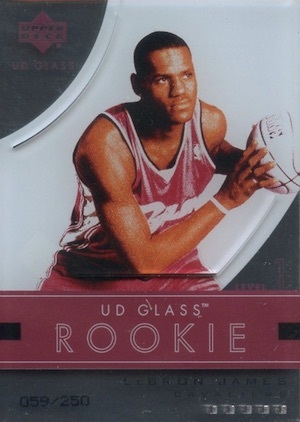 2003-04 UD Glass is a lesser-known set from Upper Deck and mainly makes the list based on its rarity and because it's printed on plexiglass. The card design is unique and relies strongly on white and red to draw attention to an image of James. However, this coloring does seem to wash out the rest of the design. 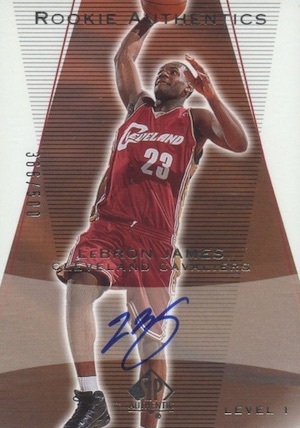 The 2003-04 Topps Chrome LeBron James rookie card represents a popular RC option for collectors and benefits hugely from the strong brand recognition. The real chase comes in the form of the various parallels, which include base Refractors (1:12 packs overall), Black Refractors (#/500), X-Fractors (#/220) and Gold Refractors (#/50) for James. Possibly the ugliest card on the list, 2003-04 SPx Basketball shows that collectors don't always care about the look of a card. The awkward layout gives the impression of three separate cards mashed together around a cut box signature and small jersey piece. Despite all these flaws, the fact remains that this is still a rookie card of one of the greatest players of the modern era. It also happens to feature a certified autograph and jersey piece along with a moderate print run. 2003-04 SP Authentic Basketball has a very similar layout to the Ultimate Collection, shown below, which is a good thing. The bronze background offers a nice contrast without being an exact match to the Cavs' color scheme. 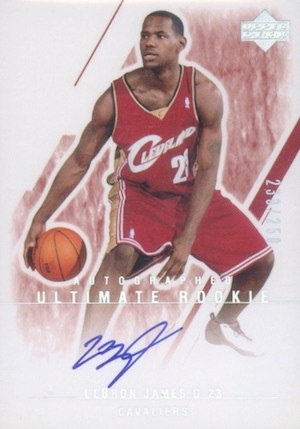 Along with the 2003-04 SPx rookie, SP Authentic is one of the most heavily-moved LeBron James rookie cards due to its mid-level print run and overall popularity. 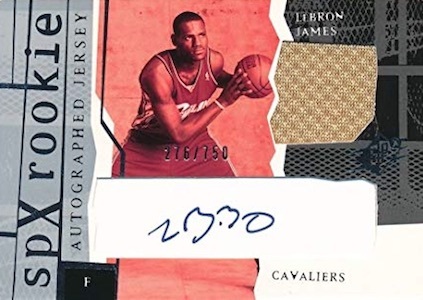 A perfect example of how less can be more, a clean design and low print run put this autographed card from Ultimate Collection among the top LeBron James rookie cards. If, like most, the Exquisite Collection is out of your price range, the Ultimate card is a worthy backup choice. However, the cost is still quite high. This card needs no introduction. Every basketball collector is aware (or should be) of the relevance of 2003-04 Exquisite Basketball and this card is the quintessential card in the set. Arguably one of the most iconic NBA cards of all-time, if you are lucky enough to even come across one, this rare card will set you back at least five figures. Pushing that number close to six figures, a BGS 9.5, jersey-number parallel (#/23) of the card sold for $95,000 in 2015. Although this is not an official rookie card, it deserves special recognition for the appealing design and obvious significance. 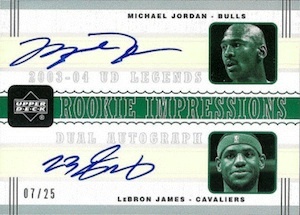 The rare card features the rookie signature of LeBron James alongside the modern basketball legend, Michael Jordan. The low print run of 25 is basically doubled to 50 because of a "Throwbacks" parallel that is also numbered to 25. The only noticeable difference between the two is that the Throwbacks version utilizes more green in the color scheme. Collectors can expect to see some serious green if they own one of these amazing cards. The two legends have gone on to appear on many signed cards together. What should be on the top 10 Lebron James cards is his rookie of the year card by upper deck. It’s a jumbo auto card and only 50 prints. Mike � These cards are from the sets listed. I have a 2001 lebron James sports card investor magazine ruby card. 1/100. What is it worth? EBay says it is a top card to have , but I can’t locate one person with it. Most copies sold on eBay recently have been in the $5-25 range. Thanks I have a signed rookie card by LeBron James with a part of his high school floor. What is it worth. I have a LeBron James 2003-04 phenomenal beginning – upper deck boxed set cards unopened. asking 2000.00 there is 20 cards. Some are worth way more. is that a fair price for both me and a buyer? Holly � Sealed sets are readily available on eBay for less than $30. 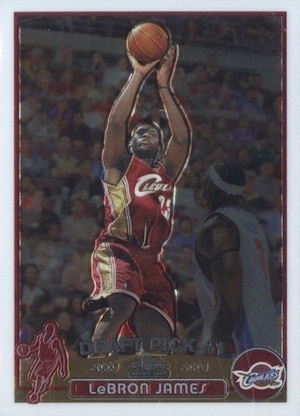 With regards to Nick’s question regarding his 2001 Lebron James Sports Card Investor Magazine ruby card 1/100. 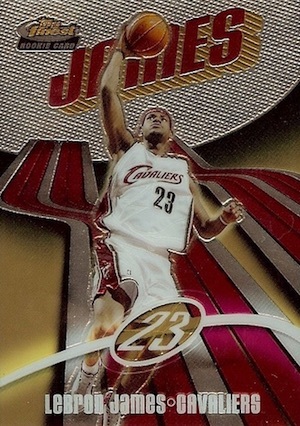 – not only is is the first sports card ever mde of Lebron, and argue ably the rarest (Gold approx. 17,500 copies, Platinum 2000 copies, Ruby 100 copies – actual date March 2002) I’ve only seen two on eBay in the last 10 years. One sold last year for $399 shortly after Lebron won the first Heat NBA Championship. And Nick, I have a serial #d 1 of the 100! Owners have been mighty quiet on the web the last 11 years. Probably waiting for it to pop. Always nice to see a mention of the Ruby card. Why are the Lebron James H.S. licensed cards not seem to be as valuable as NBA “rookie” cards? Are these not more rare? Hope someone can help explain why his PRE rookie cards are not VALUABLE- they were licensed by SVSM High School, and they are #’d. John � A lot of collectors simply prefer cards of players in pro uniforms and from mainstream sets. Similar situations can be found in all sports — 1992 Derek Jeter cards for instance. While they hold some decent values, they’re easily trumped by his MLB stuff from ensuing years. 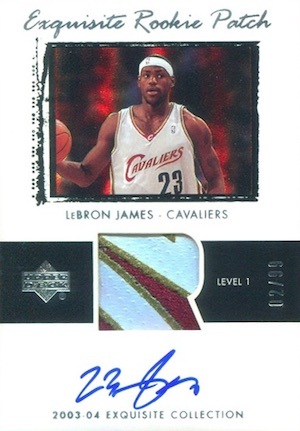 What is a 2011-2102 Exquisite LeBron James Personal Touch Autographed card (1 of of 30 in the set) worth? Harold. Thanks for the info. I have not found anyone who ever even had one of these cards. I purchased it off ebay when it was first released. I have number 74/100. Do you think it is worth getting graded?? I would assume it has to be one of the top Lebron James rookie cards to have. Hello. I have a UDA signed Lebron James First Game rookie card 9/23. I’ve seen on eBay that its selling high, but I cant believe it because I can find very little info about this card. Thank you for your time! Eric � The Finest rookie for LBJ is a great card. The list above covers the base versions of his rookie cards. Therefore, for the purposes of this list, the Finest card is ranked based on his main rookie, not the Refractor or Gold Refractor parallel. Those specific cards would be higher on this list, as would the many parallels of his other rookie cards. You do a great job. No question here, just a thank you for answering the questions from viewers that I also had. Where do you guys see prices going if the Heat 3-Peat. Jamal Miller � It certainly won’t hurt any. Because the high-end stuff is already so high, gains may be relatively marginal. But they’ll also be solidified as far as possible worst-case scenarios go in the years ahead. Nick, there are a few graders that will do magazine cards. PGI is one. I choose to not for now. It depends on the reputation of the grader whether it’s worth it. Funny that I’m right behind you with #75/100! Steve, there were 17500 copies of the gold. I’ve seen them listed for $49 graded on eBay and take quite some time to sell at that price. Hope that helps. age 19. As well as a Carmelo Anthony from 3/30/04 bother upper deck and mint what’s the value? I have what appears to be a mint condition Topps 2003-04 Lebron James rookie card. In your opinion, is it worth it to have it professionally graded if I intended to sell it? I have a 1/1 LeBron James auto that came from those Upper Deck LeBron James/Michael Jordan boxtopper bonus packs. Anyone have any idea what that might be worth? Hi…I have a James/Jordan/Kobe 2003 AOJ Lithocard, graded Gem 10 by Professional Grading Authority. It’s number 8/23…can’t seem to find the card anywhere to compare value…any idea how much it’s worth? I have an unopened LeBron James 2003-04 Phenomenal Beginning Card Set. What would be a fair price to sell it and where? Please email the answer. I won a very rare meet and greet with LeBron James that isn’t happening until next season (2016-2017 season) and hopefully he will allow something to be signed! Given the situation what would you have him sign!? @Rich, I’ll bring one of his rookie cards, any of his Miami Heat cards and his Cleveland Cavaliers card. I have a 2003-04 SP Authentic triple signature James, Jordan, and Kobe. it is 5/15 and graded a BGS 9.5 with Auto 10. I have been trying to find a price on this for many years with no luck. Can someone help? I am also very close in getting the whole set with inserts completed minus the limited and 1 of 1’s. What would that set go for as well? I’m how rear is it and the value of it ? words: first shot made, first rebound, first assist. what is it worth? cannot find such a card on eBay or anywhere else. thanks for a reply. I have a signed 03/04 rookie card when he signed with Cleveland. How should I go about having it authenticated and appraised. binder. wondering the cost of the total. 2003-04 LeBRON JAMES SPX Winning Materials Combo Lebron James Milicic BGS 9.5! !